Melvin Gingerich was born 29 January 1902 at Kalona, Iowa to John Gingerich and Lydia Reber Gingerich. He married Verna Mae Roth on 30 August 1925; they had two sons -- Owen Jay and Loren Lee. He died of a heart attack in Cambridge, Massachusetts on 24 June 1975. He is buried at the Prairie St. cemetery in Elkhart, Indiana. Melvin Gingerich received a BA from Goshen College (1926) and a PhD in history from the State University of Iowa (1938). He taught at Washington (Iowa) Junior College (1930-1941), Bethel College (North Newton, Kansas)(1941-1947) and Goshen College (Goshen, Indiana)(1949-1970). 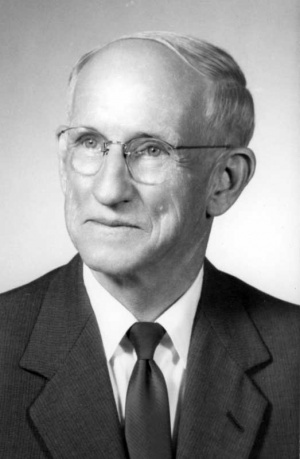 He was Archivist of the Mennonite Church Archives at Goshen from 1947 until his retirement in 1970 and also served as editor of the Mennonite Historical Bulletin, published by the Historical Committee of the Mennonite Church. His published works included Mennonites in Iowa (1939), Service for Peace (1949), Youth and Christian citizenship (1949), What of noncombatant service : a study of alternatives facing the conscientious objector (1949), Who's Who Among the Mennonites (1943, as Assistant Editor), The Christian and revolution (1968), and Mennonite attire through four centuries (1970). He was Managing Editor of the Mennonite Quarterly Review from 1952-1970. After his retirement, Gingerich continued his residence in Goshen and activities as researcher, writer, lecturer, and consultant to various church agencies at home and abroad until his death. A devoted member of the Mennonite Church (MC), his interest, concern, and service included the total Mennonite movement throughout the world. In 1969 he made a tour of Mennonite communities in Africa, Asia, and Latin America, discussing archival matters with leaders in these locations and helping them establish archival policies. In 1974 he became the first person to receive the Sister M. Claude Lane Memorial Award established by the Society of Southwest Archives and granted by the Society of American Archivists. He was a meticulous researcher, balanced writer, good organizer, and concerned counselor. Theologically he was conservative but not Fundamentalist, politically he was liberal but not leftist. His ability to communicate his strong convictions in patient compassion helped him to converse effectively with people of differing opinions inside and outside Mennonite circles. From 26 February 1942 to 19 July 1973 the Mennonite Weekly Review published his book review column, "On My Desk." The books reviewed are evidence of the breadth of his interests, which enabled him to speak and write so effectively on many subjects. His special concerns were church history, social history, international relations, social problems, and theology. Warkentin, A. and Melvin Gingerich, compilers. Who's Who Among the Mennonites. North Newton, KS: Bethel College, 1943: 82-83. Gingerich, Melvin. Mennonite Attire Through Four Centuries. Breinigsville, PA: Pennsylvania German Society, 1970. Springer, Nelson P. "Gingerich, Melvin (1902-1975)." Global Anabaptist Mennonite Encyclopedia Online. 1987. Web. 22 Apr 2019. http://gameo.org/index.php?title=Gingerich,_Melvin_(1902-1975)&oldid=104576. Springer, Nelson P. (1987). Gingerich, Melvin (1902-1975). Global Anabaptist Mennonite Encyclopedia Online. Retrieved 22 April 2019, from http://gameo.org/index.php?title=Gingerich,_Melvin_(1902-1975)&oldid=104576. Adapted by permission of Herald Press, Harrisonburg, Virginia, from Mennonite Encyclopedia, Vol. 4, p. 1149; v. 5, pp. 341-342. All rights reserved. This page was last modified on 2 December 2013, at 21:08.